Starting location: On FDR 95 near Todd Lake Recreation Area. From Bridgewater, VA travel 4.0 miles south on Rt. 42. Turn Right onto Rt 809 (becomes 747 Mossy Creek Rd). Go 3.4 miles to Mt. Solon, turn Right onto Natural Chimneys Rd. Go 1 mile to stop sign, turn Left onto North River Rd. Go 3.6 miles to stop sign, turn Right onto Stokesville Rd. Go 1 mile and turn left onto FDR 95 at the sign for the North River Multiple Use Area. Go 3 miles. Trailhead is at brown hiker sign on your left, across from the Todd Lake trailer dump station. Park along road. Description: Follow yellow-blazed trail across small bridge; after a short distance, you will come to an open area. The trail is a loop from this spot, and you may choose to go either direction. Both directions will ascend Trimble Mountain and then descend. I will describe the trail starting to the left. The trail is easy to follow and well-marked. You will steadily climb the mountain with some views to the southeast, walking among mature mixed forest. Wildflowers are abundant in springtime. You will reach a brief summit at 1.5 miles before descending, and then ascend sharply again to a second summit. After again beginning the downhill walk, there are lovely views to the west of Shenandoah Mountain. Continue down the trail, past a small wildlife pond and to the opening where you began the loop. The trail is open to horses and bikes. Why we like it: Trimble Mountain Trail is a relatively short jaunt into beautiful forest, and is a loop trail that is easily accessible from a paved road. It is located very near the Todd Lake Recreation Area, where families can picnic, camp, and swim. The campground offers flush toilets but no showers. To reach the Todd Lake Rec Area, continue on FSR 95 ¼ mile and turn right. There is also a short 1-mile trail around Todd Lake; look for the trailhead to the right of the swimming area. This trail crosses the dam and then loops back through the woods to the parking area. Please do not park inside the trailer dump pull-off; park along either side of the road. Keep your eyes open for deer, bear, and other wildlife. The small wildlife pond along Trimble Mt. Trail is home to turtles, frogs and salamanders in the warmer months. 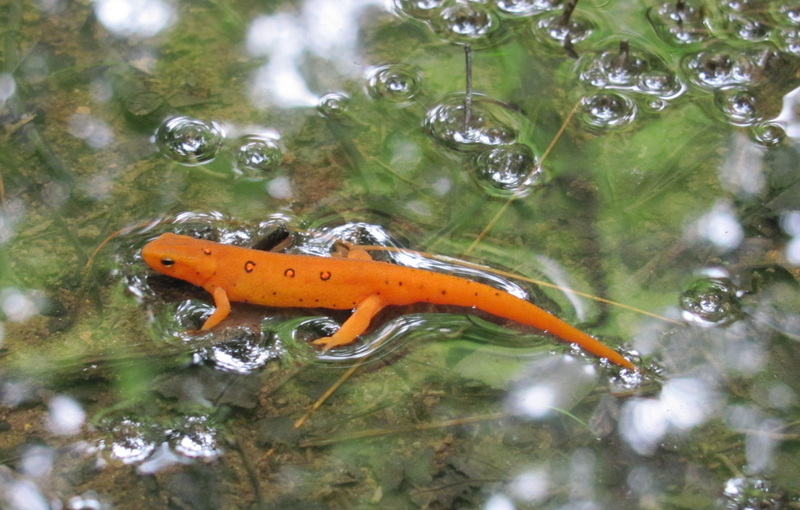 In the spring and early summer, you will find abundant newts and tadpoles in Todd Lake. You may also fish in Todd Lake. Leeches are also part of the natural habitat of Todd Lake. Should you find leeches on your skin after emerging from the water, apply table salt and they will quickly fall off. Be sure to read the informational sign about leeches at the entrance to the Todd Lake swim area.